Blog: I'd Like To Retire, Someday. 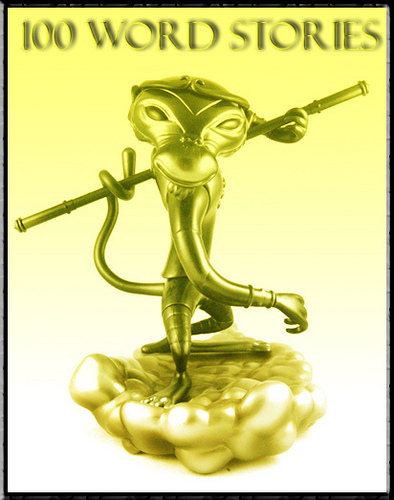 The Golden Monkey is verbally awarded to any author who submits One Hundred 100 Word Stories. He has not the patience. Luke Skywalker first met Yoda on the planet Degobah. After a short while with him, Yoda says something like, "I cannot teach this one. He has not the patience." I think this is something I have learned about myself this last year as well. I have not the patience. That's why having a professional edit my novels makes a lot of sense. I would have published "Flypaper Boy" and "Shooting Stars" before they were ready. I just got Shooting Stars back from my editor yesterday, and it looks done. I've read her remarks about the changes I made based on her previous suggestions, and we're in agreement, it could work now. She killed a lot of my darlings for me. Things I thought were pretty clever or touching were actually slowing down the pace of the story. Knowing the text is ready, I want to publish it today. "Have patience, young padawan... "
Finish the blurb on the back side of the book cover. Format the front pages and back pages of the book. Upload the cover and finalize the text with Create Space. Get the proof copy made by Create Space and check for formatting errors, make changes. Set up a Kindle Countdown of "Flypaper Boy" to co-inside with the release of "Shooting Stars"
I have a special deal for all of you non-existent followers of my blog. The Kindle version will only be 99 cents for the first two days of the release, so get it while it's cheap.